French promotional company EuroProm headed by Gerard Teysseron bid a staggering 62 000 Euro for the right to stage EBU bantam champ Karim Guerfi, 20-3, vs mandatory challenger Kazak Zhanat Zhakiyanov, 21-1. Guerfi won the title with an upset win over Stephane Jamoye after previously losing two attempts to win the French bantam crown and also losing a world title fight at flyweight against Juan Carlos Reveco. Hatton Promotions, Zhakiyanov’s promoter, bid 25 696 Euro - a more normal sum considering the title and weight division involved. When and where will be announced within shortly. Valery Yanchy, 22-3-2, and Andrea Sarritzu, 34-6-5, will again clash for the vacant EBU flyweight title February 14 in Milan with OPI 2000 as promoter. Both men have by now a long history with this title winning, losing and drawing a number of fights. The fought to a split draw in October also in Italy. Kennessey totally inept, unwilling and outclassed and it was allowed it to go on for much too long. Kennessey took a standing eight count before it was stopped. Malcev went down rather easily in the first, again in the second and when he slipped and fell a third time the towel came in. Kalinovic looked sharp though working in short, effective bursts of punches. Adnan was too eager and lacked timing while Karsev was careful and green but opened up in the last to win the round. 40-36 on all cards. Peleguer brave but limited against a fast, slick but lightpunching opponent. 40-36 on all cards in a fight where Salimi forced the action against a smaller and somewhat chunky opponent. 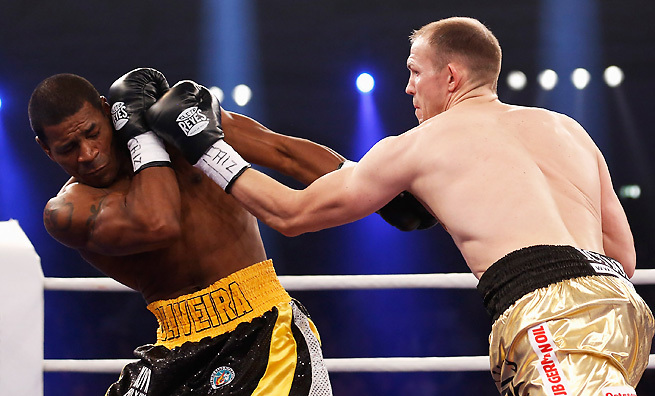 Brähmer won the vacant WBA regular title on scores of 115-112, 117-110 and 117-110. Oliveira was down after what looked like a low blow in the 10th and took a count and was stunned in the fifth but staged a strong finish. Brähmer entered the ring first after Don King intervened and wanted the highest ranked boxer to enter the ring second - and that was Oliveira and this caused a long delay which upset the fans. Culcay, now trained by Gary Logan, retained the WBA I/C title on scores of 116-111 twice and 118-109. Belinga was down in the fifth. 76-75 and 74-74 - so rather "2-0-1" than "zwei zu ein". N´Dam, now managed by Gary Hyde, returns and outscored Fitzgerald, who was down in the fourth. V retained the EU title on scores of 118-109, 117-109 and 117-111. Lora won the WBO Euro title on scores of 114-113 and 114-112 with a third vote 119-112 for Fedchenko. Lora was down in the second and was a late sub for Nacho Mendoza. 59-54 twice and 60-54. Stolyarchuk was down in the sixth. Mazikin was down once in the third and twice in the fourth after bodyshots. It was scored 77-73 twice and 77-72 for Tereshkin who faded in the later rounds. Plotnikov comes out smokin´ and didn´t stop until it was stopped. WBO Euro and IBF East/West titles. 119-107, 118-112 and 115-115. Title? Announced for six, but then became a four rounder. Chioui back after serious traffic accident. Belgian superlightweight title, 100-86, 99-89 and 98-91, Madni took a standing eight in the tenth. WIBF, WBFed and WIBA titles. Morelli was floored in the sixth and ninth and Persoon had a point deducted after that as she hit Morelli, on he floor. Ref Daniel Van De Wiele stopped it in the tenth to save Morelli from further punishment. Persoon was ahead 89-79 on all cards at the end. Lovaglio won the Italian cruiser title from defending champion Bruzzese. Cortes came in on short notice for Oleg Lukanyuk. w: Massi Tachour, Fra W 4 Mihail Orlov, Fra -- or Norsedine Adad.